How does the economy work when all the workers are robots? Recently, Elon Musk had the chance to share his thoughts on universal basic income (UBI) at the World Government Summit in Dubai. At the Summit, Musk had the opportunity to talk about the future, and the challenges the world will face in the next hundred years – including artificial intelligence (AI), automation, and the job displacement expected to come with it. When asked about the challenges civilization is set to face in the near future, Musk began by noting the threat of artificial intelligences that surpass humanity. Musk also relayed concerns that autonomous technology will impact jobs, and he noted that we will likely have intelligent, massive-scale automation for transportation relatively soon—within the next few decades, in fact: “Twenty years is a short period of time to have something like 12-15 percent of the workforce be unemployed,” he said, pointing out the extent of how automation will disrupt car-based transportation specifically. [The] much harder challenge is: How will people then have meaning? A lot of people derive meaning from their employment. If you’re not needed, what is the meaning? Do you feel useless? That is a much harder problem to deal with. How do we ensure the future is a future that we want, that we still like? 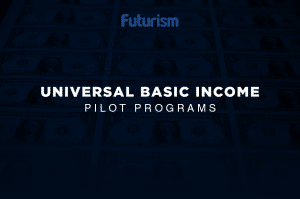 As the UBI discussion continues, various nations and institutions have already began their own pilot programs to test the model. Finland, for example, started its pioneering UBI program this year, which was launched by the federal social security institution, Kela. It will give out €560 ($587) a month, tax free, to 2,000 Finns that were randomly selected. Similarly, eBay founder Pierre Omidyar’s philanthropic investment firm has given $493,000 to help fund a universal basic income program in Kenya. In a couple of years (or less? ), there might be enough data from these experiments for us to consider just how effective a solution UBI truly is…and whether or not Musk is right.